Numbers are equal. Geometrical objects are congruent. Two shapes are congruent if one can be moved or rotated so that it fits exactly where the other one is. If one of the object has to change its size, the two objects are not congruent. They are called similar. Also, every two objects which are congruent are similar at the same time. Geometrical objects can be equal, too, but only if they are in the same place, so an object can only be equal to itself. 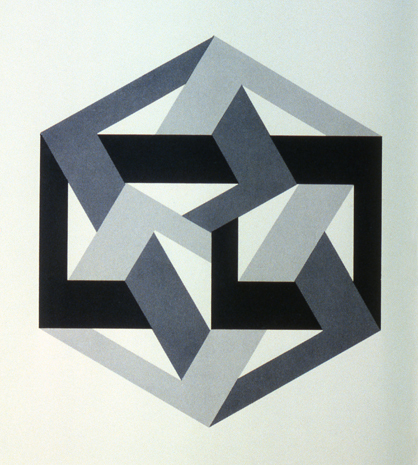 Norman Ives design from three congruent shapes (rotated) interwoven, that are also similar but clearly not equal.